The way that bats acrobatically navigate and forage in complete darkness has grasped the interest of scientists since the 18th century. These seemingly exotic animals make up one in four mammalian species and play important roles in many ecosystems across the globe from rainforests to deserts. Yet, their elusive ways continue to fascinate and frighten people even today. Over the last 200 years, dedicated scientists have worked to uncover how bats hunt and navigate using only their voice and ears while flying at high speed in complete darkness. Still, the inaccessible lifestyle of these small, nocturnal fliers continues to challenge what we know about their activities in the wild. Understanding the impact bats have on their ecosystems – for example how many insects a bat catches per night – has still not been directly measured. Most of our knowledge on the natural behaviour and foraging ecology is based on elaborate, but ground-based experiments carried out in the wild. These experiments generally track their behaviour using radio-telemetry, record snapshots of their emitted echolocation calls with microphones, or involve extensive observations. A sound and movement tag with a 3-gram battery designed by Mark Johnson. The improvements in consumer electronics over the past few decades have led to smaller and smaller microphones and movement sensors. Riding on this development, the availability of biologging devices to remotely track and record the behaviour of wild animals from whales to birds has exploded in recent years. The analytical methods and quality of data have both improved alongside the tracking technology. For large species, such as toothed whales, these developments have led to increasingly detailed understandings of how they live. One great example of this is how the DTAG-3 tag helped Wisniewska et al. to discover how harbour porpoises catch up to thousands of small fish per day. Can these biologging tools be used to study much smaller mammals that also hunt with echolocation though? 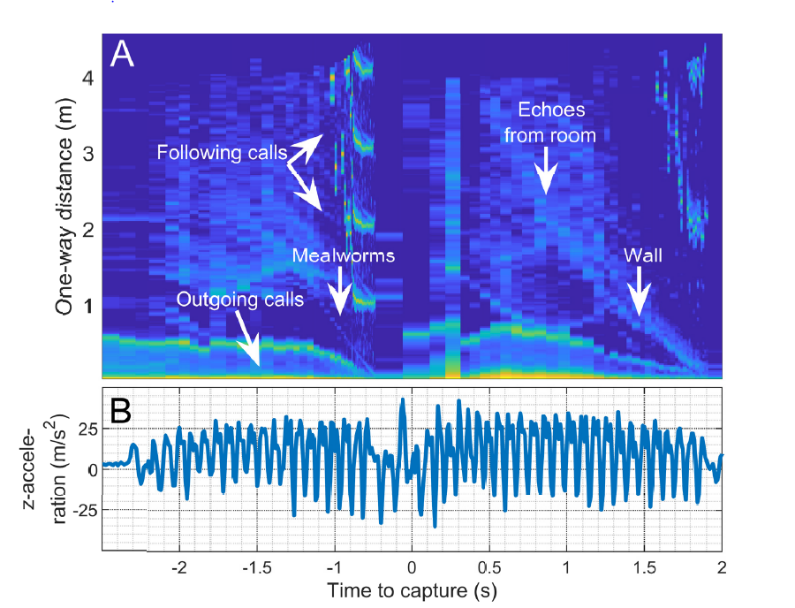 The sensory stream returning to the bat catching a tethered bunch of mealworms is visualized (A) with synchronous wingbeats recorded by accelerometers (B). 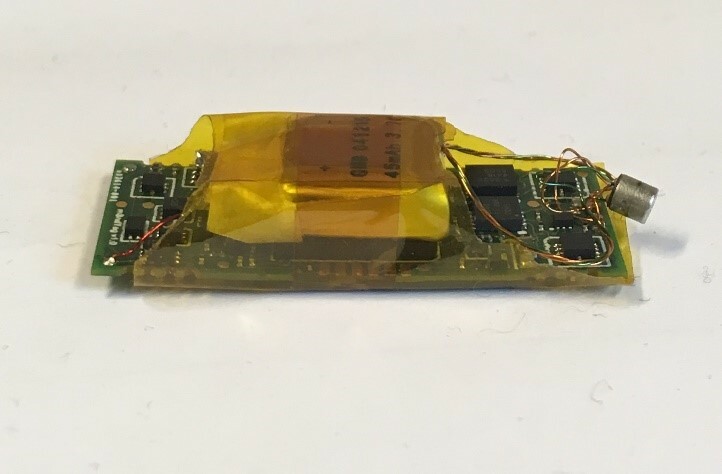 Small biologging tools that can sample continuous high-resolution data from bats are now being developed. Using such small sound and movement devices, we can directly measure the foraging behaviour and the movement of bats flying and hunting in their natural habitats. 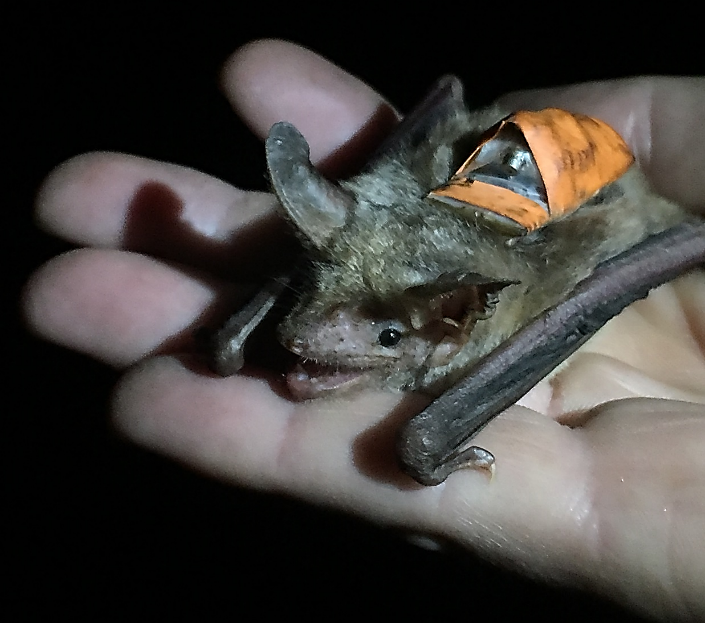 Studies using on-board tags with integrated GPS have shown how social foraging of bats is determined by the stability and predictability of prey. The more unpredictable the prey is the more bats tend to aggregate when foraging. On-board tags can also now capture the primary sensory information in the form of echoes, while the bats are on the wing. To ground truth this type of data from wild bats, we have trained bats to catch tethered mealworms in a controlled setup in the laboratory while carrying a tag. In the video below, the echo stream carrying the necessary sensory information from the mealworms to the bat has been quantified and visualised. Based on only these echoic streams, bats can extract information on the size and location of the prey. They use this information to guide the pursuit and capture. To visualise and quantify the sensory scene of the bat in the wild, we have released Greater mouse-eared bats carrying the tags into the night. The bats are usually recaptured about one week later. We’re working to understand how the echoic scenes guide the behaviour of the bats when they hunt for insects outside of laboratory settings. Recapturing bats is difficult, but also rewarding. These types of biologging studies give us a fundamentally new understanding of the natural behaviours of bats in the wild. As we continue to see the effects of anthropogenic stressors in the terrestrial habitat, it is urgent to understand how bats acquire sensory information, how and where they forage and how they might be affected by changes in their environment. This is necessary, as one third of the worlds’ bat species are threatened, or we are lacking data to inform on their conservation status according to IUCN. On top of this, bats are often are often falsely accused of transmitting deadly viruses, inciting negative attitudes towards bats amongst the public. So, in the spirit of Bat Appreciation Day, it’s more important than ever to inform the public on the amazing lives and important ecosystem services of bats. Our hope is that this understanding and appreciation will lead to better protection of these incredible and ecologically important species in the future. To find out more about using sound and movement tags to track bats, read our Methods in Ecology and Evolution article ‘A 2.6‐g sound and movement tag for studying the acoustic scene and kinematics of echolocating bats’. This paper will be free to access until the end of 2019. A huge thanks to the Carlsberg Foundation ‘Semper Ardens’ grant and Human Frontiers Science Program for funding this study. This entry was posted in Conservation and management, Field Methods, Methods papers and tagged BAT, Bat Appreciation Day, Biologging, Echolocation, Foraging Behaviour, Sound and Movement Tags by Chris Grieves. Bookmark the permalink.